Celebrity Blogger Week continues with our penultimate CB, Neil Alan Willard. Besides being the only Celebrity Blogger with four (count ’em!) “L”s in his name, Neil is related to most of the clergy in the Episcopal Church. Also, we like to use the word “penultimate” whenever the opportunity arises. The Rev. 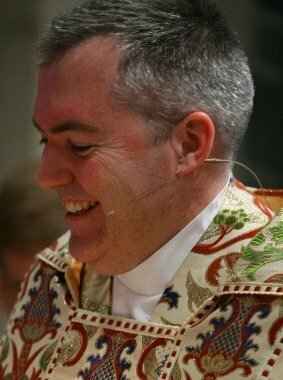 Neil Alan Willard, one of the original Celebrity Bloggers and an early adopter of Lent Madness, is Rector of St. Stephen’s Episcopal Church in Edina, Minnesota, a first-ring suburb of Minneapolis. His study there overlooks beautiful Minnehaha Creek on its way to the Mississippi River. He’s married to Carrie, also beautiful, and they have two sons and a Labrador Retriever in the household. Outside the house are chipmunks, raccoons, and coyotes. No kidding. Last bit of trivia: his father-in-law and his sister-in-law’s husband are both Episcopal priests at different congregations in Aiken, South Carolina, and his brother-in-law is also an Episcopal priest, previously in Wasilla, Alaska, and now in Kapolei, Hawaii. No kidding. Follow him on Twitter @neilwillard and be sure to check out his blog Laughing Water. How long have you been a Celebrity Blogger? What do you like about doing this or what have you learned along the way? As someone who was raised on “Tobacco Road” and attended Wake Forest University, I know a little about ACC basketball and religious devotion to a favorite team. I’m not only a Demon Deacon but also the Rector of a church named for St. Stephen, and a member of the Martyrs, our men’s group. I really got into the first tournament of Lent Madness as soon as I realized that our patron saint, the first martyr and one of the first deacons, needed a boost in the second round. While that was a tough loss for us, we had made a strong, last-minute effort. So the next year I gladly accepted an invitation to become one of the original Celebrity Bloggers. I took C.S. Lewis all the way to the Golden Halo in 2011 and Dietrich Bonhoeffer to the Faithful Four in 2012. I’m proud of that record (but not too proud, of course, since that would be unsaintly). What I’ve learned is that birds of a feather do indeed flock together. 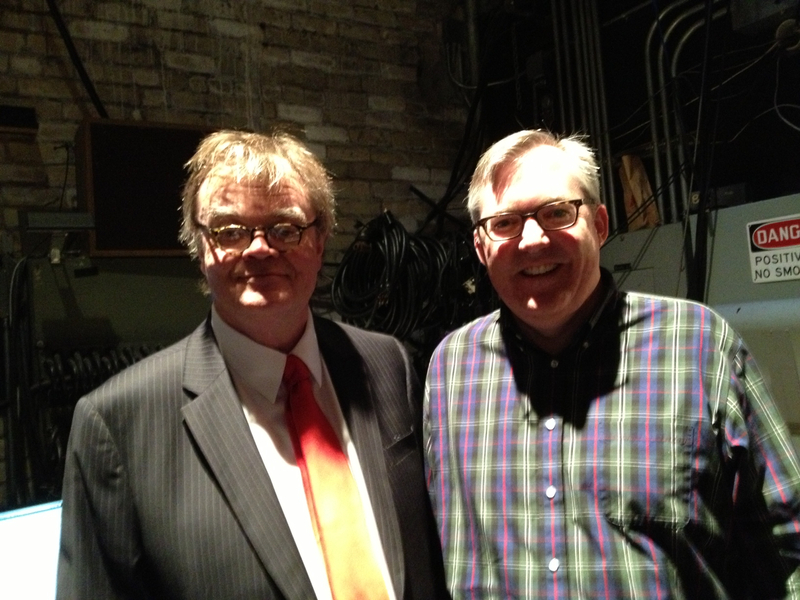 Last October, for example, I had the opportunity to meet Garrison Keillor backstage at the Fitzgerald Theater in St. Paul after a live radio broadcast of A Prairie Home Companion. It may take a moment for you to connect the dots, but it seems obvious to me that this gathering of celebrities in the Land of Lake Wobegon was a direct result of the blessings of Lent Madness. What should the Lent Madness faithful know about you? 15 Comments to "Celebrity Blogger Week: The Rev. Neil Alan Willard"
Well, Fr. Willard is OK with me since he attended Wake Forest therefore qualifying him as having attained residency in the great state of North Carolina. Was he there with “Bones” McKinney? Anyhoo…the bishop who finally ordained me came from Edina, the late Rt. Rev. George Lazenby Reynolds, and that’s what I know about Edina. If there’s a rumble from way underground in the Sewanee/U of the South cemetery where bishops galore are interred, it’s because I’ve now celebrated 23 years as a Vocational Deacon. Well, after some coffee, the brain fog is clearing and now I see that Fr. Willard and I also share another geographical relationship as his in-law kin were also Episcopal priests in Aiken SC, the site of my first teaching job where I lasted two years. It’s hard to live in a city where where walking on grass reserved for horses could be grounds for severe repercussions. I also am a Bonhoeffer disciple and am still sorry he didn’t get the 2012 GOLDEN HALO. Boo! Hiss! I am not ashamed to be called an Anglo-Lutheran, so I quite enjoy ice fishing in these theological waters. Not surprisingly, these waters are also deep. For example, less than two miles from St. Stephen’s, straight down West 50th Street in Minneapolis, is Mount Olivet Lutheran Church, which is the largest ELCA congregation in the country. Nearby in St. Paul is Luther Seminary, which is the largest ELCA seminary in the country. Luther Seminary is where I often write my sermons, and St. Stephen’s frequently has guest speakers from the faculty there. Most of my clergy friends love the website http://www.workingpreacher.org (especially the weekly “Sermon Brainwave” podcast and “Dear Working Preacher” column). Methinks preaching in the Episcopal Church needs to be improved, and these Lutherans are helping us do that. The only thing I’ll say about your second question is that I am also not ashamed to use an industrial-strength snow blower. As you may have observed, a lot of people in these parts are proud (but not too proud) to eschew snow blowers in favor of old-fashioned shovels. That’s just silly. God made snow blowers and set them in large box stores and small hardware stores, and saw that it was good. This I believe. Maybe Garrison Keillor would include information about Lent Madness in his weekly broadcast — a Lutheran bloc might just send the Golden Halo to Martin Luther . . .
1) “Bones” McKinney coached the Demon Deacons before I was born! I was there mostly during the time of head coach Dave Odom. 2) Bishop George Reynolds (Tennessee) served as rector here 1976-1985. He followed Bishop John MacNaughton (West Texas) and preceded Bishop David Joslin (Central New York). There must be something in the frozen water. 3) I feel your pain with respect to Dietrich Bonhoeffer’s loss to Emma of Hawaii (a direct result of the powerful “Big Pineapple” lobby). Pastor Bonhoeffer would remind us, I think, to embrace a theology of the cross rather than a theology of glory. Hey! Leave big pineapple out of this. Emma definitely had a lower-48 fan base. You are absolutely right about Emma’s national fan base. I would only note, however, that the last time my brother-in-law and his family visited us from Hawaii, they brought with them fresh pineapples for which there was no shipping charge by the airline. In other words, those pineapples flew for free. If you ask me, that’s like putting money directly into voters’ pockets. Yet I must admit that we enjoyed the taste! Once again proof that the powers that be have chosen well when they looked through our family for a scholar. The other three of us can’t spell half the words that our esteemed family member uses. But you have a pool, Dale looks onto a golf course, and Paul lives on the island of Oahu. I’m the only priest in our family who has an industrial-strength snow blower. I hear what you’re saying about news on the Yahoo homepage. Imagine if things eroded to the point that Lindsay Lohan appeared in a future Lent Madness bracket or — I can’t believe I’m typing this — as a “Celebrity” Blogger! …in which case she’d probably really deserve that Halo…or perhaps something in a new awards category — “Most Improved” or some such. Just sayin’… Saint (now!) Augustine was quite the wastrel in his time, too. Exactly! This Anglo-Lutheran heartily endorses your theological instinct here (“simul justus et peccator” and all of that). 2 Trackbacks to "Celebrity Blogger Week: The Rev. Neil Alan Willard"